Offering a taste of colonial-era ambiance in the middle of modern Bangkok, Cabochon Hotel blends abundant antiques with high-end luxuries and impeccable service. 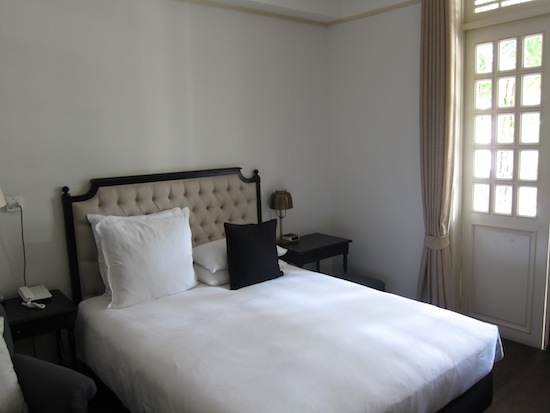 The mid-size boutique hotel is one of the classier upper-range choices found in the Thai capital. Not your average upscale Bangkok hotel. The modern-built yet elegantly old-style four-storey building emerges from behind tall-reaching trees at the far end of a quiet street. 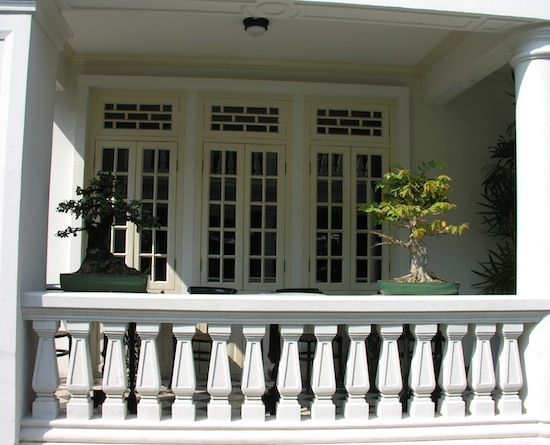 Before even stepping inside, the narrow shutters, plants in old ceramic vases, white pillars and round wooden tables perched on grey-and-white checkered marble floors shoot you to a balmy 19th century estate in Shanghai or Singapore. A shiny vintage Jaguar (the car, not the animal) sits parked out front in honour of Lao Yeh, the late businessman, antique collector and adventurer that the hotel was created to emulate — or so goes the legend. The French word cabochon stands for the gemstones that this compelling man apparently prized. If the hotel owner, himself an avid collector, dreamed this mystique up to sell rooms, he’s done quite the job of it. Reverence for a bygone era continues in broad marble hallways adorned with framed 19th century newspaper clippings, crystal chandeliers and all sorts of Asian antiques. Some will find the embalmed sea turtles and antique elephant tusks quirky, if not intriguing, though animal advocates might be appalled. Just about everything you see, except for the building itself and some of the furnishings, comes from decades or even centuries ago. Glimpse of a studio with balcony. The Cabochon’s 18 rooms are divided into six different types, starting with the cheapest “studios” and reaching up to a “two-bedroom residence”. Coming in at 26 square metres, the studios make up for their relative lack of space with considerable comforts and a sophisticated white, black and grey scheme. Sumptuous mattresses are set up with cushioned headboards, placed next to vintage chairs and teakwood tables. Most rooms come with large furnished balconies accessed through white French doors with glass panes to allow natural light in. All of the bathrooms are gorgeous, but honeymooners should splurge for a suite with a tall-sloped tub and Italian taps. Standard in-room features include desks, LCD TVs, safes, minibars and WiFi, with some of these stowed in cabinets to retain the old-style ambiance. Suites come with private sitting rooms, kitchenettes and dining tables. While the rooms are excellent, Cabochon’s common areas are unforgettable. On the ground floor, the so-called Joy Luck Club features an extensive library, including rare books, spread around several antique tables, sofas, sculptures and an embalmed zebra’s head gazing down from a wall. Like the Mandarin Oriental’s tea room, this space hints at what life might have been like for well-heeled world travellers over a century ago. Extensive breakfasts are served in a bright dining room with wooden tables spread far enough apart that you can greet the day quietly. Along with a slender but fairly long swimming pool with cushioned loungers, the rooftop boasts an artistically designed grass courtyard rimmed by slabs of laterite. We’ve also heard good things about the on-site Thai Lao Yeh Restaurant. Plenty of places to relax with a pot of tea. 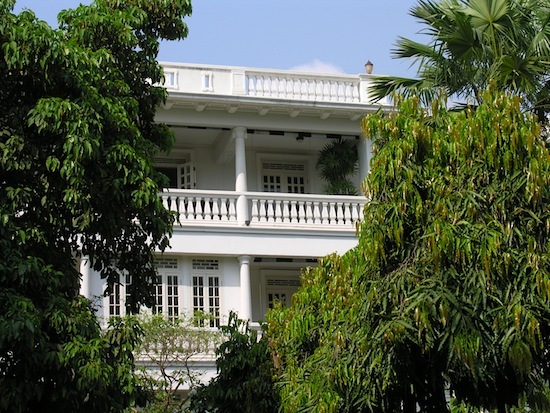 As for location, Sukhumvit Soi 45 is a short and relatively quiet side street with the Cabochon marking its end. There’s little else to speak of on the soi apart from Quince, a rustic European eatery. Phrom Phong BTS skytrain station is a 10-minute walk from the hotel and the area is stacked with spas, cafes, bookshops, bars and restaurants, including several serving Japanese food. Though a polite and helpful receptionist told us that rates may go up slightly in peak season, the value seems reasonable for what you get, and discounts are offered for stays of three or more nights. Other intriguing upscale choices around Sukhumvit include Maduzi Hotel, AriyasomVilla and the Eugenia, which was designed by the same antique-loving people who did Cabochon. If you’re after something cheaper but similarly comfy, consider S15 and Napa Place. Check rates at Cabochon Hotel on Booking.com. Twin studio; plus 300 baht for queen studio. Two-bedroom suite is 9,900 baht year-round. Room: Superior double room, low season: 3,800 baht, high season 3,800 baht. Notes: Twin studio; plus 300 baht for queen studio. Room: Deluxe double room, low season: 5,500 baht, high season 5,500 baht. Notes: Executive queen studio. Room: Suite, low season: 6,600 baht, high season 6,600 baht. Notes: Two-bedroom suite is 9,900 baht year-round.